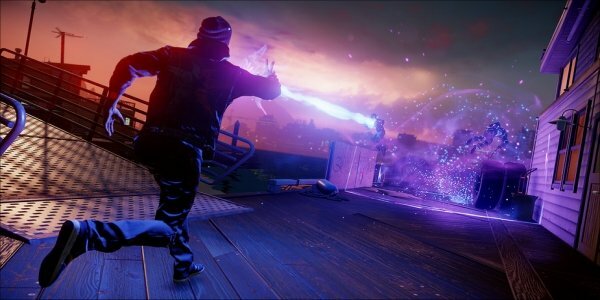 The co-founder of Sucker Punch Studios and the producer of inFamous: Second Son, Brian Fleming, opted to answer some fan questions about the upcoming exclusive for the PS4, and he had some interesting things to say about the game. Actually, to be honest, they weren't that interesting if you've been following the game – so if you haven't been following the game, you'll probably find this post somewhat interesting (I can't make any promises, though, it's likely you'll get bored before you get to the second quote). This is good news. One of my biggest gripes – apart from railing on the atrocious AI featured in the CES demo – was that the powers looked like spam-fests when Rowe was caught under fire from a goon squad. Repeatedly he pelted the armored force like he was spamming a laser blaster from Space Invaders. It's good to know that this was likely due to the power not being leveled up, as opposed to the game mechanics being broke. I feel enlightened now. Thanks Fleming! As for multiplayer... Brian rolled out the news to make it known that there's no secret multiplayer option tucked away into the game. If this were the 16-bit or 32-bit era, maybe there would have been some secret, hidden-away feature, but this is the era of dirty ports and perpetual crunch-times. So, no Dice. “The inFAMOUS games always have secondary content spread throughout the world. There’s a fairly large DUP presence inside the city that remains to be cleared out after you finish the main game. They’ll continue to launch incursions into the city after you’ve wrapped up the campaign, so they’ll be plenty to keep you going. That's cool beans. No one likes paying $60 for a four hour long campaign and a laggy, throwaway multiplayer component. I'm not talking about any single one game in particular... you know, I'm just saying. InFamous: Second Son is set to launch at the end of March, exclusively for the PlayStation 4. You can pre-order the game right now or sit back and wait for the reviews to drop before diving head-first into Sony's first big post-launch exclusive.